Ok, this is really crime related, but it is cool enough to warrant making an exception. 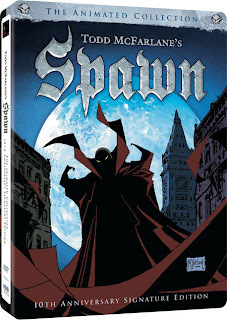 Todd McFarlane’s Spawn: The Animated Collection -The 10th Anniversary Edition. This series originally aired on HBO back in 1997 (Hence this being the tenth anniversary edition). Evil begets evil. Hell begets hellspawn. Exploding from the comic book page onto the screen, Spawn is a deadly tornado of untapped, unwrapped merciless power. He was once a man…now he’s a hellspawn, battling the forces of evil on earth…and in himself. Gradually discovering the terrifying power he possesses, Spawn fights to uncover the truth about his identity and fulfill his destiny. Trust me, this is cool stuff. Retail price will be $39.98.